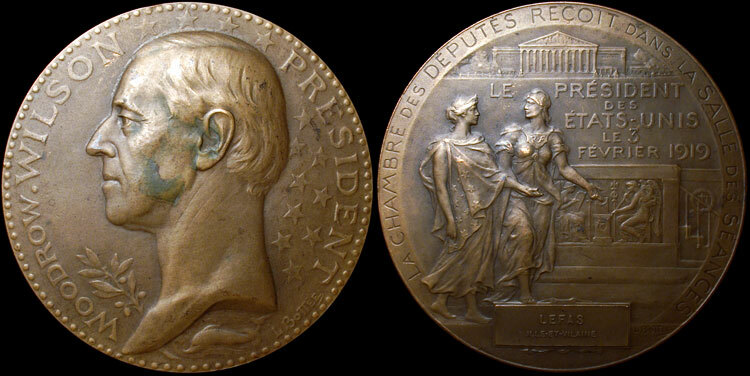 Bottee L. - 1919 - Franco-American Struck Bronze Medal, 68mm, 91.4g., Paris Mint Edge-punch: Cornucopia BRONZE. Obverse: Wilson bust, left, inside pearled rim border. Laurel, stars, and dolphine in surrounding field. Reverse: Marianne and Columbia surrounded with LA CHAMBRE DES DEPUTES RECOIT DANS LA SALLE DES SEANCES, Wilson visits the French Chamber of Depuities 2/3/19. Grade: SS+ (VF) slight discoloration evident on cheeck and ear.